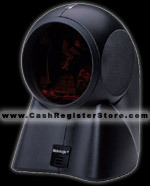 Complete scanning package for only $2,999! See below for details. The QT-6600 is Casio's latest touchscreen terminal. The QT-6600 terminal operates on a NON-Windows operating system thus providing stability, reliablity and peace of mind. The QT-6600 is immune from viruses, crashing and other errors such as DLL or driver errors commonly found in Windows applications. Operate during peak hours with confidence that the QT-6600 will reliably operate and will not crash. The QT-6600 boasts an amazing 60,000 plu (scan file) count. Use numbered product codes or scannable barcodes. A live running inventory program gives instant data on sales and current inventory levels. Monitor product status to prevent product depletion. The QT-6600 operates over a local area network (LAN). Up to 16 remote printers can be used on the LAN to print receipts in distant areas of the establishment. 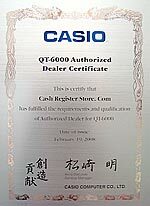 With other Casio models printers are limited to a max distance of 50' due to RS232 limitations. There are no distance limitations for the QT-6600. With the QT-6600 tech support is faster and easier for the end user. Since an IP address is issued for each terminal, we can make adjustments to your program from our office and instantly download changes or make corrections to your program. This saves you time and the hassle of trouble shooting the problem. The QT-6600 features a tiltable (from 20-70 degree) large 15" LCD display which is much larger then the 12" QT-6100 display. Plus, the QT-6600 includes a rear 2 line customer display which is not standard on the QT-6100. 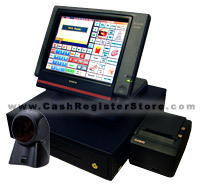 Available options include multiple cash drawer configuration, remote customer display, remote printers, credit card interface, scanning, Berg and coin dispenser options and PC programming with CV-33 software to instantly upload program changes while operating the register. Yes, change prices and other information instantly from a back office! Flash card technology is available allowing saving of the program to the flash card for secure back-up. The flash card enables sales reports to be saved and opened in a .csv file on the PC for spreadsheet report viewing. Six RS232c ports support flexible, varied configurations of peripherals which include printers, scanners, scales, PC, integrated credit/debit/gift EBT card device, coin/liquor dispensers, pre-paid card device, kitchen and video surveillance devices. An Ethernet 10/100 Base T/TX port ensuring smooth, fast and reliable in-house communications using popular CAT 5 cable for easy wiring. 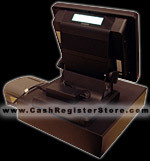 Two standard cash drawer ports utilizing Casio�s medium (DL-2434) and large (DL-3622) sized heavy duty black drawers. An optional three-line alpha/numeric LCD remote customer display (Casio QT-6060DB) for those environments requiring flexibility for placement of a customer display. Operator access to the terminal can be accomplished through three methods; secret code, optional dallas key or through an optional magnetic stripe reader. An optional PS2 keyboard can be attached to assist in operations requiring alpha or numeric entries such as special text messages within a transaction, customer file entries or program changes in program mode. An operation will resume quickly where it left off after a power failure. A master & backup system for guest checks maintains integrity of vital transaction info. Password codes can be assigned to staff, limiting access to various program modes and operations. Graphical table icons show check total, server, last time ordered time check opened. Seat # assignment with consolidation on guest check and KP printing. Simplified cash drawer declaration with media menu. Department stock status with alarm when below minimum. Floating customer charge file with discount level.